Calibration Notes: The E60 series from Panasonic is able to adjuct both 2 point and 10 Point white balance settings as well as a 10 point Gamma Correction. It's also got an RGB Color Management System, but we left that alone to achieve our calibrated settings. Doing it though the White Balance gets a the colors much more balanced over using the RGB Color Management. 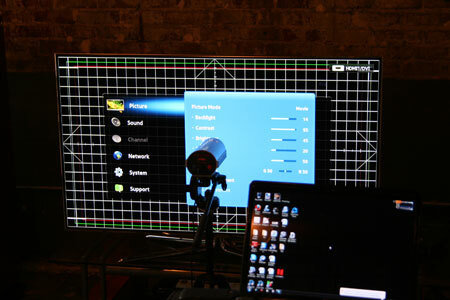 You'll see that this TV calibrates very well and is comparible to the the plasma S60. Contrast was lower on the E60 though. There is slight light leakage from the bottom sides. Test images looked great on the E60.